Quality comes from people, and the excellence of people comes from their capacities. No mediocrities, no uncertainties, people are the essence of the organization. Regular updating courses allow the growth of the team which, being part of the company, reaches the top of the need. Our satisfaction brings excellent results in each phase, from the project to the production and from the first meeting with the customer to the after sale service: that’s why we can guarantee that our supply meets all the parameters and every need of people who trust us. D’ Agostino, a Firm Guarantee. 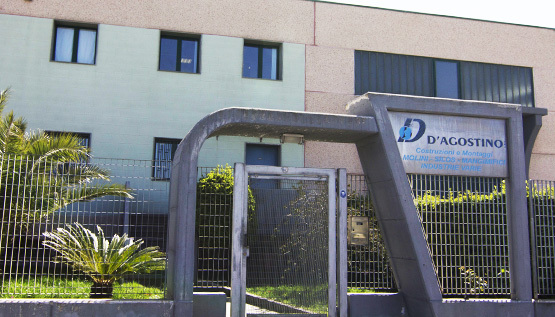 D’Agostino Srl is one of the most important Italian companies caring about construction of milling and agro-food industry machines and plants. Our company is able to realize tailored and customized machines, according to the customer need and allowing him to take the full advantage from its activity. Thanks to our experience and technology, our objective is to renew ourselves. Technological know-how, search for perfection, staff skills, high quality production and certified quality give value to our company.